Used for craft, hobby and finish carpentry projects. Sturdy plastic packaging reduces staple breakage. Fits TR200, TR250, TRE500, TRE550, TRE650 Electric Brad Nailers. For Use With: Stanley Fastening PHT150C, TR100, TR200, TRE500, TR100HL; Arrow: T50, T50PBN, ETF50, T55, HT50; Powershot: 5700 Use steel rivets for very heavy duty jobs and when riveting steel to steel. Use aluminum rivets for lighter weight jobs and materials such as aluminum, fabrics, plastics, leather, etc. Use washers when joining soft materials or when existing hole is oversize. Use steel rivets for very heavy duty jobs and when riveting steel to steel. Use aluminum rivets for lighter weight jobs and materials such as aluminum, fabrics, plastics, leather, etc. Use washers when joining soft materials or when existing hole is oversize. 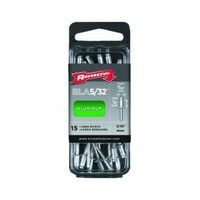 Arrow Rivet, Long, 5/32 in Diameter, 1.29 in Length, 1/2 in Grip, Aluminum Rivet, For Metal Cabinets, Aluminum Doors, And Windows, Metal Fixtures, Automobiles, Heating Ducts, Gutters and Downspouts Used for craft, hobby and finish carpentry projects. Sturdy plastic packaging reduces staple breakage. Fits TR200, TR250, TRE500, TRE550, TRE650 Electric Brad Nailers.